Gendo'sPapa wrote: Khara is still regularly tweeting that they are recruiting animators for new projects. Soooo unless they need help finishing the final Animator Expo shorts - which should all be very far along if not completed - or are doing extensive animation work for another company, they may be doing some work on a certain film in a certain series. If the script & storyboards were far enough along I imagine a great deal of work could done under Kazuya Tsurumaki's control while Anno is off doing his giant kaiju flick. Not that I've personally worked on productions in that field but when it comes to kaiju effects & hand drawn animation I have to imagine most of a director's job is saying what works & what doesn't. In my mind I'm just dreaming up a world where 2016 brings us two new Hideaki Anno movies. Khara is currently recruiting production assistants. It may be for Eva but it may not. Key animators for the films have never been recruited openly. What I want to know is, will Anno be wearing and prancing around in the Godzilla Suit on set? Cause that would be just adorable. Okay, even though I'm probably more excited for this film than pretty much anyone on the planet, allow me to be the one to throw a wet blanket on things. And then I started remembering a few things about Toho, such as the fact they they're a larger studio and of their past relationship with Anno. As we all know, Anno's done some of his best work in smaller, less controlling studios. 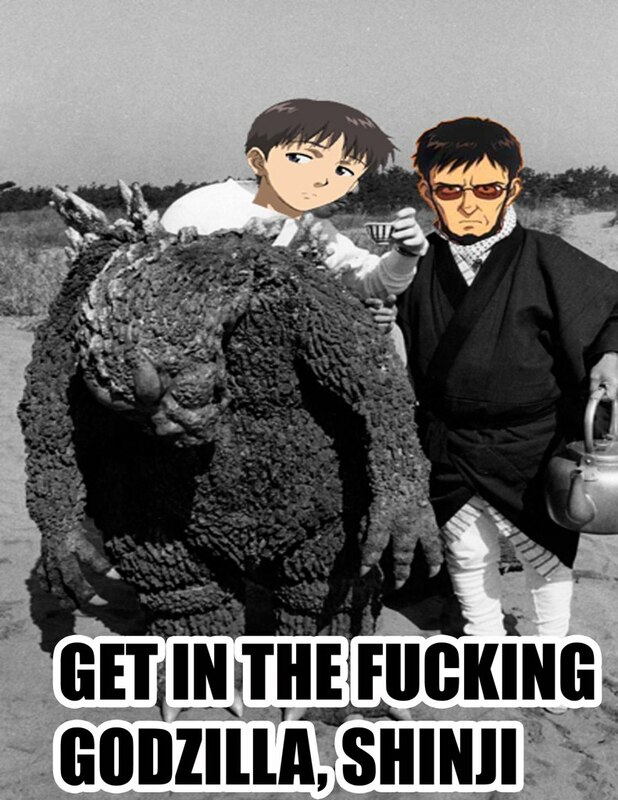 GAINAX and TV Tokyo placed very few mandates on NGE, and the ones present simply meant Toji couldn't die, while many others were subverted through home video releases and theatrical releases. Most of the actual restrictions came from either budget or time restraints, which, again, we're subverted through home video and theatrical editions of the narrative. And then there's Anno's other works released in equally smaller fashions. The biggest dirivative franchise he's touched was Cutie Honey, and that isn't held by a large corperation with strict mandates, nor was it produced with an eye towards competing with American spectacle films. Toho, on the other hand, is a large Japanese studio which has always seen Godzilla as direct competition against American monster movies. They might want more of a say as to how their flagship monster is to be used. We, in fact, have an example of how Toho and Anno have worked together with strict studio mandates with the TV series The Secret of Blue Water. In it, Anno was forced to extend the episode length and work with minimal staff, having to put in 18-hour days in order to animate scenes himself. It was what started Anno's longest retreat from filmmaking in his professional career, with 4 years between Nadia and Eva. Now, I'm still as optimistic as ever. Afterall, who knows Toho's use of Godzilla through history better than Anno and Higuchi? For the most part I think they'll see eye-to-eye with the studio on a lot of things. The only concerning thing so far is Toho's claim to use CGI, but they've used that before in Godzilla movies in order to produce tanks, heat-beam attacks, and fighter jets, while the monsters were still man-in-suit creations. The only people insinuating that Godzilla will be CGI are the America bloggers who are used to seeing richer studios throw millions of dollars at polygons in an attempt at photo-realism on made-up dinosaurs, so we probably don't have anything to worry about here either. I have no real point to make here beyond that. I thought I'd just raise a few poins for consideration is all. What do you guys think? Sailor Star Dust wrote: should be my first Godzilla flick to experience? Though that recent American one sounds tempting. ^ Revenge of Iris is, in my opinion, the best gaint monster fight movie ever filmed. I wouldn't take the CG line too seriously. When this film was announced in December they also said they still hadn't decided on how to do the effects. Higuchi's upcoming Attack on Titan film done at Toho is mainly relying on practical effects and I'll assume this will too. Here's a video showing how the effects are done for that film. Godzilla VS Megalon is amazing for all the right reasons. It gave us the Godzilla dropkick, the inspiration for Jet Alone, and a great MST3K episode. I just watched the original. It's an interesting movie, but has some big flaws. I'm pretty sure Anno can do a better job. Should I watch some of the sequels? AFAIK they are more lighthearted and silly, which isn't bad. Here's a link with a translation of a statement by Anno. He talks some about Rebuild too. Looks like it was really rough on him. I might not like what happened in Q, but geez, poor guy. Hopefully he'll have a better experience from here on out. Anno's statement from the official Eva website was already translated a few pages back by myself & Xard. Cool to see BlueFin/Tamashii Nations interested in this too! Sounds like it'll be out sometime in 2016 with FINAL whenever the hell afterwards. kuribo-04 wrote: I just watched the original. It's an interesting movie, but has some big flaws. I'm pretty sure Anno can do a better job. Did you watch the American version or the Japanese? People go on and on about that, but the monsters were in the movie about as much they are in any of their Japanese counterparts. And the fight at the end was probably one of the best kaiju fights ever filmed (though once you start to really analyze it it can get deeply disturbing). The real problem with that flick was the stupid main lead. He had to be involved with everything, and everything he touched turned to dumb. I swear, forget about using the nukes as bait, the monsters were following the lead. And speaking of following the lead, Bryan Cranston was a tough act for him to follow. Too bad he wasn't in the movie more. Still overall I liked it, even if it wasn't exactly what I was expecting. It'll be interesting to see how Anno handles it. In some ways I get the impression he has very different views on certain things than Inoshiro Honda did. Though I could be wrong. Anyways I expect this to be much different than his work on Eva, due to him coming in as a fan, rather than projecting as much of his own personal experiences and troubles into it. So no Final for a while then...hmmm. Admit I'll be surprised if we don't have any info on it this year. It's physically impossible for me to be sad about any of this situation. Anno directed his greateš animated work durin my childhood, and now he's directing my childhood's favorite movie monster. I just can't see a reason to get sad over this. Bagheera wrote: Did you watch the American version or the Japanese? The Japanese one. I hear the american one is almost a different movie? My problem isn't with the time they were in the movie, but how this was handled. In the original we don't see Godzilla that much because he just doesn't come out of the water that often. When he first emerges and some of the characters are still in their houses, it feels natural that you don't see him, as they don't either, and it creates a sense of suspense. In the 2014 film there's the infamous scene in which Godzilla finally appears (which is awesome), and then, when he is about to fight the monster, we cut to news for no reason whatsoever. It's so obvious why it was done this way, that it is almost as if the director came out and told you "We'll leave the fight scene for the end, kay?" To me that breaks the immersion. Also, what is the purpose of following a character and seeing things through his perspective if we cut to other stuff during the events that most impact him. We follow this guy for no reason. BTW, what do you mean by the fight being disturbing (and yes, it's an awesome fight)? kuribo-04 wrote: BTW, what do you mean by the fight being disturbing (and yes, it's an awesome fight)? I’m not sure what he means by it, but I do know that I sobbed like a baby when the MUTOs dropped a building on Godzilla. One does not reference Terror of Mecahgodzilla lightly, and the 2014 movie referenced it twice with good results, in my opinion. FreakyFilmFan4ever wrote: I’m not sure what he means by it, but I do know that I sobbed like a baby when the MUTOs dropped a building on Godzilla. One does not reference Terror of Mecahgodzilla lightly, and the 2014 movie referenced it twice with good results, in my opinion. I was rather referencing Chuckman's review of the movie, which was rather sobering. kuribo-04 wrote: The Japanese one. I hear the american one is almost a different movie? Yes. Very much so. The Hollywood executives at the time didn't think an American audience would empathize with a non-white cast so they very poorly edited in Raymond Burr. Really, The American Edit of Godzilla should be watched purely for history's sake because it's crud compared to the original version.